Alternatively, the Glazunov museum has a very comprehensive website in English, where one can view paintings in high-def. At the lower right-hand corner of each image there is the option “View in Full Screen”. Click on this, and then again on the image, to see it in high-definition. There is currently much talk of a renaissance of conservatism in Europe and America. The phenomenon of a “New Right”, “Alt Right” and other “Rights” has been widely discussed in the New Yorker, Breitbart, Buzzfeed, the Daily Beast, and elsewhere. Serious discussion of monarchism, skepticism of non-European cultures and immigrants, table-turning historical revisionism, and much else has burst onto the scene in a way unthinkable just a few years ago. Such are the fruits of the age of Trump. Western conservatives will no doubt find it interesting that these subjects are actively discussed in Russia, and have been for 30 years, since the crumbling of the USSR. One of Russia’s most effective, consistent, articulate, and profoundly conservative voices happens to be a popular painter. That his medium is visual is significant because his ideas can theoretically cross linguistic barriers, although they have yet to do so, but they connect to millions of Russian in a way that written and spoken words never can. A subject of debate and fascination in Russia, a profile of him and his ideas is the subject of this article. The answer speaks volumes about the hyper-active 86 year old, who is, in fact, far more than a prominent artist. He is a unique phenomenon, straddling the worlds of art, history, politics, art collecting, social activism, and academia, wielding remarkable influence. Russia Insider is primarily a political publication, and what will be of most of interest to our readers is the improbable fact that since the fall of the USSR, Glazunov has consistently been one of the most articulate and influential advocates of a profound political conservatism which harks back to another century, with the influence, resources, and ability to have his ideas seriously and widely discussed in Russian society. For years he has been warning of the negative effects of immigration on Europe, which he believes is dying. In 2003 this issue was the subject of a major painting entitled “The Death of Europe”. Very well-known in Russia with an active presence in the media, and heatedly discussed by his fans and detractors, little has been written about him in English. A Google search turns up a 30 year old short and completely inadequate article about him from the NYT in 1988, and little else of quality. Not that Glazunov isn’t well known in Europe. The reason most likely is that he speaks fluent French and Spanish, but not English, so his reach and relationships are far better known in these worlds, than in the Anglo-saxon. To begin with he is a monarchist, and believes that democracy is a scam which would best be done away with. He argues that Russia’s greatest achievements in every area - geographic expansion, economic growth, military glory, architecture, literature, Christian life, painting, decorative arts, population growth, public morality, international power, and harmonious relations within a highly diverse multinational empire, and with its many neighbors - all were attained under the rule of the Tsars, and that most of what happened since then has been an unmitigated disaster. Furthermore, he believes Russia should return to a uniquely Russian system of social organization which reached its zenith in the mid-19th century called “Soslovie”. There exists no exact European equivalent, but the closest one is the medieval “Estates of the Realm”, the orderly division of society into various functions - knights, merchants, clergy, farmers, etc. The soslovie system gave social status, and sometimes hereditary titles to individuals, uniting them in a sense of civic pride and unity in service to their sovereign. Not limited to upper classes and nobles, it extended well into the middle classes, the Tsarist bureaucracy, and even the peasantry. Readers of 19th century Russian literature may well have wondered at the many titles carried by its diverse characters, like “Collegiate Assessor”, or “Provincial Registrar”. For an explanation of this unique system, see the Wikipedia entries: Social Estates in the Russian Empire and Table of Ranks. The main point for Glazunov, is that this mobilized the citizenry, gave their lives noble meaning and purpose, and allowed for harmonious cooperation while lessening the emphasis on competition and personal enrichment, the driving forces in a pure meritocracy. He stresses that this is very different from the Marxist concept of classes, which emphasizes conflict between social strata, and very different from the Indian caste systems, which are more rigid and exclusionary. He speaks out publicly again and again that Russia is fundamentally hamstrung because it lacks an elite which truly has the interests of the country at heart, as opposed to their own, and that only once that is in place, can the country truly thrive, as it did in the 19th century, for example. He believes this elite has to be titled nobility. He looks down his nose at the United States, whom he sees as a parvenu nation of cultural bumpkins, culturally capable of nothing more profound than Mickey Mouse and held in the thrall of a crass consumerist obsession with money and commerce. In contrast to the values of the marketplace, he calls for placing spiritual and political ideals in first place. He believes that patriotism, service to society and its head, a monarch, are far more important than filthy lucre. He is a pious Russian Orthodox Christian, embracing the church’s historical role as the essential partner in a ruling duopoly of temporal and spiritual power. The eccentric musings of a man of the arts, not to be taken seriously? Actually no, he has an audience of millions who agree with him, and reaches people not just with his famous paintings, but in books, movies, TV appearances, and public speeches. 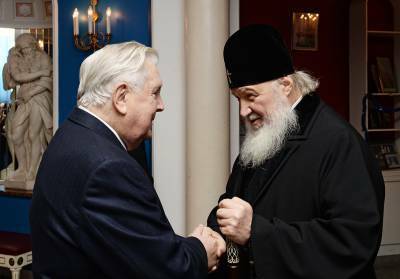 The head of the Russian church, Patriarch Kirill, in a televised visit to Glazunov’s museum, at one point turned to the cameras, and explained that Mr. Glazunov deserves special praise, because “visual memory” is more powerful, emotional, and immediate than verbal or theoretical, and therefore Glazunov is worth a thousand writers and chatterboxes, because he has reminded the nation in pictures of the glory of orthodoxy, of Russia’s military and spiritual triumphs, of her greatness. Mr. Putin has also made a televised visit, as have dozens of other celebrities and dignitaries. 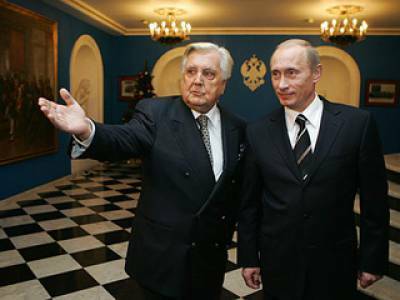 Mr. Glazunov keeps a guest book for VIPs, and it contains a mind-boggling list complete with glowing compliments of famous names: prime ministers, movie stars, artists, museum directors, ecclesiastics, academics. 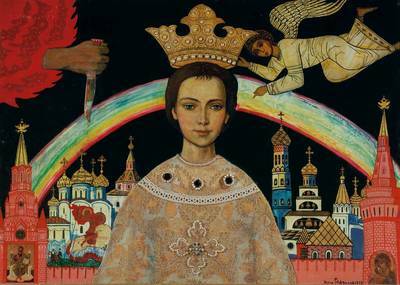 Although he is known foremost as a painter, in fact the „Glazunov Phenomenon“ extends far beyond the walls of museums and exhibition halls. Let’s start with a partial list of the man’s achievements. 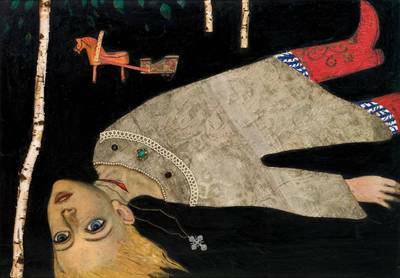 Public shows of his paintings have been far and away the most popular not only in the history of Russian art, but perhaps of any contemporary artist ever. Crowds have famously waited in lines for 8-10 hours, week after week, as visitors to his exhibit in enormous halls climbed into the millions. These astonishing attendance rates occurred during the perestroika years, and the following decade, and were driven as much by his political message as the aesthetic appeal of his paintings. Russians were eager for a new take on politics, and his ideas found a huge and enthusiastic response among broad masses of everyday Russians. His fans reach into the highest levels of government, which in 1997 created a large museum just to house the prodigious quantity of this work. It stands in a grand building a block from the Kremlin across the street from the Pushkin Museum of Fine Arts, Moscow’s equivalent of the Metropolitan in New York, or the Tate in London. The academy has published an art book featuring the works of its graduates, which are truly astonishing in their level of expertise. Here is a link to a Russian internet store which carries it. Glazunov has also had a major impact in the field of political activism. In the 1960s he started a social movement to preserve architectural landmarks in Russia, which ended up having profound influence, saving hundreds of churches from destruction, and inspiring generations of writers, filmmakers, and many others, who embraced his ideas and developed them. Dozens of leading conservative Russian thinkers, writers, and political leaders point to Glazunov as a guiding light who opened their eyes to a new understanding of Russia’s past and future. 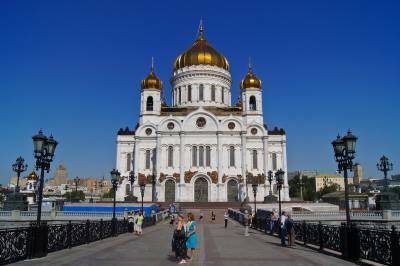 At the time, he called for the reconstruction of the massive Cathedral of Christ the Savior, Russia’s largest cathedral, famously dynamited by the Bolsheviks in the 30s, calling the demolition an affront to Russian history and patriotism. 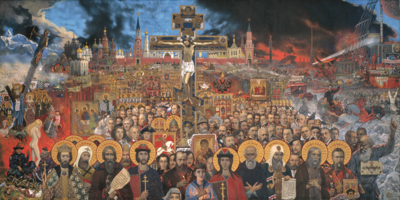 The idea seemed outlandish at the time and was roundly denounced by the Communist authorities of the day, but 35 years later, in the year 1999, this is exactly what came to pass, with Glazunov again leading the public campaign for what many admit is miraculous. Today, Glazunov can gaze at the golden domes of the cathedral from the windows of his museum with ironic satisfaction. He also practically single-handedly created a painting genre he calls „Passion Plays“. These are enormous canvases occupying the whole wall of a large exhibit hall, filled with sometimes hundreds of figures representing ideas from his political and historical thinking. 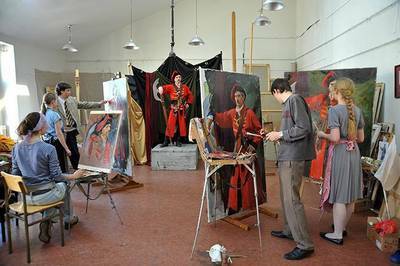 These are the paintings he is most famous for in Russia, where they are wildly popular. Of Glazunov’s 9 monumental canvases of this size, 5 of them are of this genre. You can see them all in high-def here: (see technical note at beginning of this article). Of particular interest are “The Market of Our Democracy” (1999), a stinging indictment of the market reforms urged on Russia by the West, and “The Great Experiment” (1990), and equally blistering critique of the Communist experience in Russia. Glazunov is also an accomplished author who has collected his political, religious, historical, and social ideas in two massive volumes entitled „Russia Crucified“ (available only in Russian), which tells his life story and passionately argues his case for conservatism. It is a fascinating and compelling collection of erudition on an improbably wide range of subjects - primarily history, but also political philosophy, archeology, literature, mythology, and religion. Type „Илья Глазунов“ into Youtube search, and you will find several full-length documentary films (all in Russian) recounting his remarkable life story, often with him as a lively and skillful chief narrator. Furthermore there are dozens of clips of him appearing on news and talk shows, where he expounds at length on his ideas to eager interviewers. Watch him give speeches before crowds of admirers. He is an accomplished speaker, entertainer, witty, urbane, profound, passionate, truly remarkable. And finally, to top it off, he was chosen to lead the restoration of the stupendous Grand Kremlin Palace in the late 1990s, the massive Tsarist palace which is the main structure inside the Moscow Kremlin. (Wikipedia) The palace was built in the mid-nineteenth century to celebrate the greatness of Russian autocracy, a fitting assignment for Glazunov, the convinced monarchist. So art is only a part of the man’s life, and in the art world he is highly controversial, with many detractors. 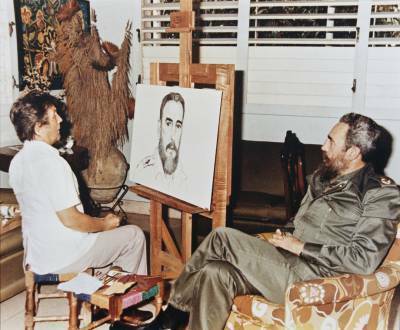 Critics say he is a mediocre artist, rather a skillful networker and politician who produces "kitsch“ which appeals to the masses, who became wealthy by collecting and trading art, then used his wealth and influence to have museums given to him. His complete and utter dismissal of any modern art hardly endears him to the chablis and cheese crackers crowd, let alone the „installation art“ types, whose work he finds frankly preposterous. But his admirers are many and not exactly artistic ingenues. They include many of Russia’s most respected writers, such as Alexander Prokhanov, Valentin Rasputin, and Vladimir Soloukhin (admittedly all arch-conservatives themselves), and many, many others. But why rely on the opinions of others - we have tried to include a wide variety of his works in high resolution in this article. Judge for yourself. He thinks the masonic movement destroyed Russia, culminating in the Russian civil war, the destruction of the monarchy, and the massacres of Russians right up into WW2. To Glazunov, the masonic movement, and its course through Russian history, was evil’s most successful manifestation. The Decembrists (a 19th century revolt by nobles, many of them inspired by masonry, seeking a constitutional monarchy which was foiled) deserved everything they got, and then some. Detests what they represent. Traitors and scoundrels. Ivan the Terrible was a great sovereign, completely misrepresented by Russophobic western historians, starting with the moniker “Terrible”, which he wasn’t, not in the least. 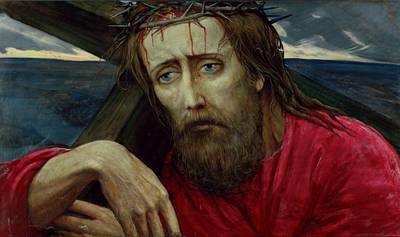 He is fascinated with Russian icons (paintings), of which he has a staggering collection. Slavs were a great civilization predating any European analogs. Says it is complete nonsense that the Slavs „invited“ the Vikings to rule over them - more western lies. Absolutely and completely thrilled that Crimea is again Russian. He produces vast quantities of historical data and arguments proving that Crimea has been inhabited by Russians since the dawn of time, that the Ottoman occupation was a brief interlude, and that Catherine the Great and Prince Potemkin rightly gave them the boot. Obsessed with history, which is the subject of most of his paintings. He emphasizes the importance of knowing and honoring your country’s history and accomplishments. Tries to convey this knowledge in his paintings. He likes to paraphrase Disraeli: “History is not the battle of classes - it is the clash of races and religions.”, and again “Ideological positions are always based on religious and ethnic foundations.” The Bolsheviks were a murderous thugs who committed genocide against the Russian people on a scale without historical parallel. He is very concerned about the demographic crisis in Russia - insists that this be corrected soon before it goes too far. He recommends supporting traditional family values and encouraging families to have as many children as possible, 3-4 at the least. Fascinated with old things, the beauty of old things. An incessant collector. Dismayed at the lack of respect for old beautiful buildings, churches, etc. Believes they carry the soul of the nation. The experience of Russia in the 90s was a genocide similar to the tragedy of the 1917 revolution. A complete disaster and atrocity. In 2003 he warned that immigrants are descending on Europe and will destroy her unless they are stopped. Believes Europe is dying, that all hopes lies with Russia. Glazunov’s views on this last point are fascinating and have clear historical and political origins. He begins by giving his definition of art, which he explains must consist of three things: 1.) It must contain an understanding of the battle of good and evil in this world, 2.) It must be devoted to showing the beauty of this world and the love which underlies it, and 3.) It must be aware of the beauty and mystery of the spiritual world. He quotes one of his favorite Russian artists, Vaznetsov who explained: “My art is a candle before the face of God”, and another of his favorites, Vrubel, who argued that the goal of art is to awaken the great possibilities of the human spirit. Further he explains that the first practitioners of modern art were Communist revolutionaries of the late 19th and early 20th century, many of them from Russia - Malevich, Kandinsky, etc. 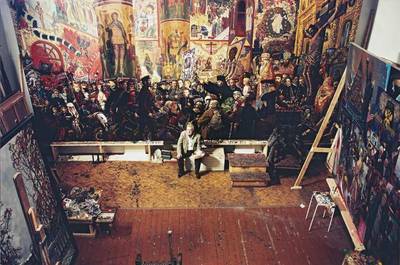 After the revolution, these artists thought of themselves as the “Avangard of Communist Art”, as “Commissars”, whose historical role was to smash the old art, just as their counterparts in the political world were massacring the upper classes, and blowing up the churches, attrocities of which these Commissars of the art world undoubtedly approved. Glazunov argues that the art they produced can not be described as art at all, rather as anti-art, an effort to destroy real art. He states flatly: “The black square is not art”. He says that evidence that the new, communism-inspired art cannot be art is that it does not have a national character, claiming, as communism claimed, to be international, universal. Glazunov insists that all art has to be national, which accurately reflects the reality of the world, and it also is by nature, aristocratic, but that it should at the same time be democratic, reflecting the thoughts and values of the people. He points out that it is a great irony that although the Communist Comissars of the political world have been relegated to the ash-heap of history, they still reign supreme in the museums and university art departments of the West, something he finds an abomination, because he equates them with the blood-thirsty killers of Communist Russia. When asked who he considers examples of the last true practitioners of art, he names Mikhail Nesterov (Russia - d. 1942), Arnold Boecklin (Germany - d. 1901), James Whistler (USA - d. 1903), and John Sargent (US/UK - d. 1925). The impressionists - no, they don’t cut it because they do not reflect the reality of the world, which he stresses, does not mean that art has to be realistic. But the impressionists reflect the world not as it is, which is already moving away from art. Van Gogh? A madman, not an artist. Glazunov argues that art existing separately from the real world is essentially a Satanic fantasy. In person, Glazunov is animated, jovial, jowly, warm and generous, plying his guests with delicious Russian veggie pies, sweets, and gallons of tea, eyes twinkling, sometimes pounding his fist for emphasis, eyes flashing. He starts the discussion with the announcement that we live in an age of stark battle between Good and Evil, and that if you don”t understand this, you understand nothing. He give the impression of a man in a hurry, as if he urgently wants to warn the world of the error of its ways, a voice in the wilderness.